“Their method is planned and organised. If your clients are companies or professional and you are looking for the best way to market to them, stop searching. 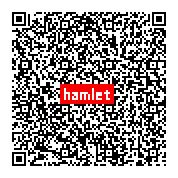 Just contact Hamlet. Or download our contact as vcard to use on your adresslist.